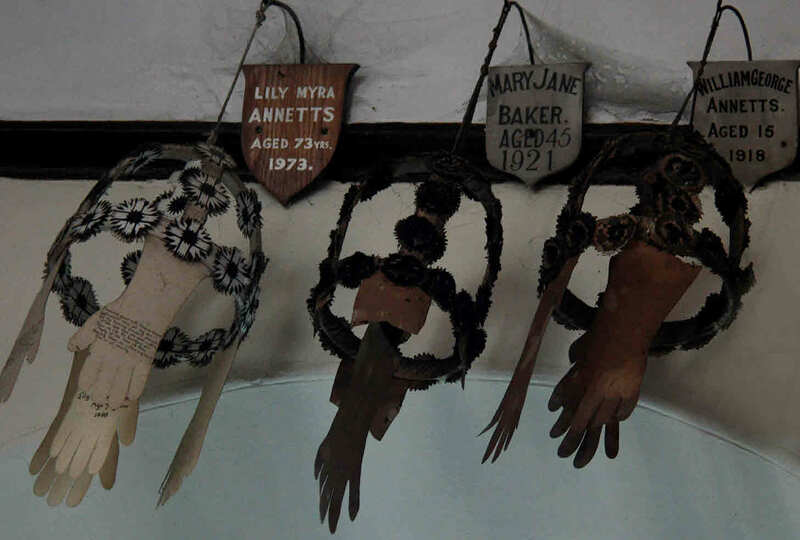 Abbotts Ann is one of the very few parishes in which the medieval custom of awarding Virgins’ Crowns has survived. In the early days of Christianity, funeral garlands were emblems of Virgin Martyrs and the practice of making maidens’ garlands presumably derives from that. Shakespeare, in referring to the burial of Ophelia, says “she is allowed her virgin crants (crown)”. A crown may he requested by the relatives of the deceased person, who must have been born, baptised, confirmed and have died, unmar-ried, in the parish, and must have been of unblemished reputation. The crown must be made of freshly cut hazelwood (virgin wood), and is decorated with black and white paper rosettes. Five parchment gauntlets hang from the frame. On one of these are written the name, age and year of death of the deceased, and on each of the other four a verse of a hymn is inscribed. At the funeral service the crown is suspended from a white rod and carried in procession by two young girls dressed in white. 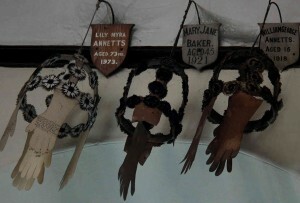 After the funeral the crown is hung from the front of the gallery for three weeks, and if it is not challenged it is then hung from a bracket near the ceiling of the church, with a scutcheon bearing the name and date. No crowns survive from the earlier church, hut since the rebuilding forty-nine crowns have been hung, thirteen of them for young boys and the rest for girls and women. Tradition has it that when a crown deteriorates and falls it is not re-hung. The daughter of headmaster Monty Dance remembered her grand-mother, on Sunday mornings sailing into church and turning right to bow to the Virgin’s crown which commemorated Sarah Jane Dance. The last two of these funerals took place in 1953 and 1973. Miss Florence Jane Wisewell, aged 72, who lived in Little Ann, was buried with due ceremony in Sept. 1953. The burial was widely reported, indeed a cutting sent from an American paper referred to “England’s Answer to the Kinsey Report”. (This was a well-publicised document on sexual behaviour.) The last burial was that of Miss Lily Myra Annetts aged 73′ of Church Lane. Among the crowns already hanging in the church is one for her young brother, William George Annetts, who died in 1918 aged 15. With today’s increasingly mobile population very few people are likely to spend all their lives in one parish and this ancient custom may disappear. 23 WILLIAM MUNDY TAMLYN AGED 16? 1855?